Nigeria’s Senate does not have a mace. 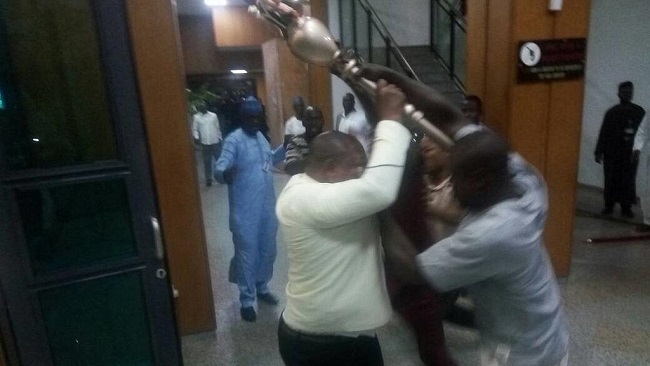 The ceremonial staff and symbol of authority which usually precedes the Senate President was stolen by thugs who invaded the red chamber of Wednesday morning during a plenary session. A live Facebook video carried by the Senate showed that proceedings for the day were well underway when confusion was registered at the entrance of the building. Even though sessions are not to proceed without it, the deputy speaker, Ike Ekweremadu, who is presiding in the absence of Speaker Bukola Saraki has continued with proceedings. “The Senate of the Federal Republic of Nigeria has just been invaded and we are not going to take it kindly. This is an institutional invasion. So I want everybody to settle down,” he appealed. Local media portals are pointing to a recently suspended senator, Ovie Omo-Agege, as the brain behind the attack. Reports say about ten men involved in the operation sped off in a black 4×4 vehicle after taking the mace.